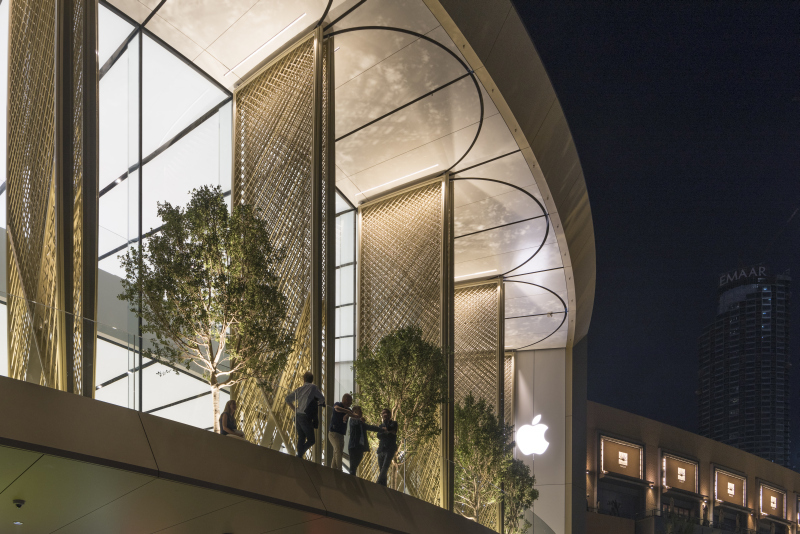 With the design of the Apple Dubai Mall, architecture firm Foster + Partners has managed to create an inspirational experience that sets the store apart from other mall-based retail spaces today. Situated alongside the iconic Burj Khalifa in one of the most visited urban centres in the world, which attracts over 80 million visitors every year, the Apple Dubai Mall spans over two levels with a 56,6m wide and 5,5m deep terrace overlooking the spectacular Dubai Fountains. 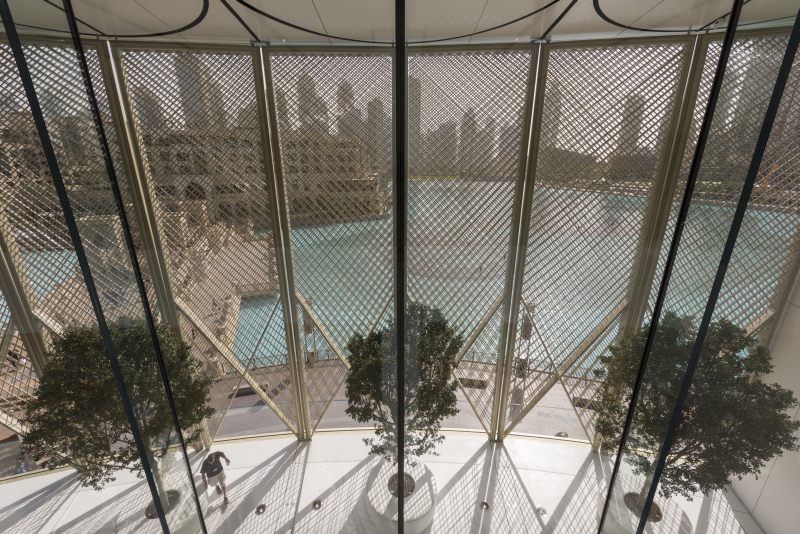 A first for any Apple Store, the terrace provides unparalleled views of what is the world’s tallest performing fountain, reaching over 274m high. Innovative “solar wings” provide shade during the day and open during the evening to reveal a breath-taking view of the waterside promenade and fountains. Made entirely of lightweight carbon fibre, each of the 18 wings has multiple layers of tubes forming a dense net. With their movement inspired by a falcon spreading its wings, the “solar wings” craftily combine kinetic art and engineering. Following an in-depth study of sun angles, the rods have been distributed in higher concentration where the solar radiation is the most intense over the year. 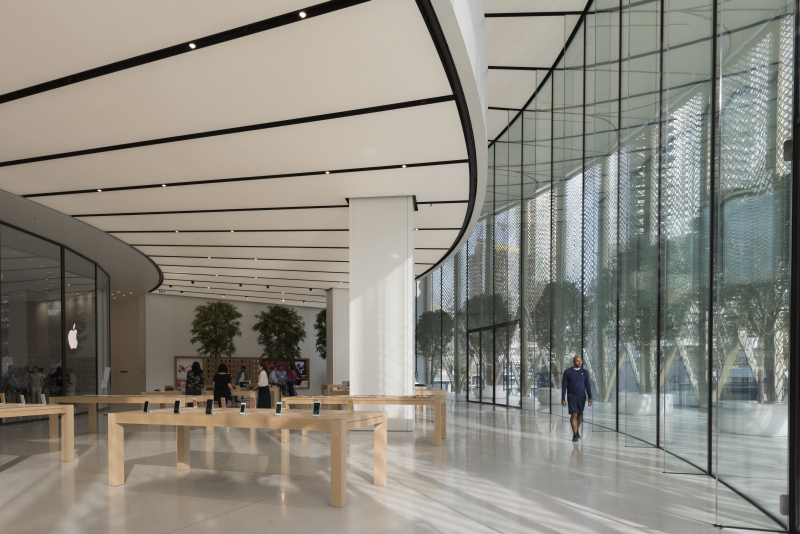 The unique pattern allows clear views out for people standing on both levels of the store, and casts dappled shadows deep into the interior. Large planters featuring nine trees incorporate seating for visitors to enjoy the view. These planters rotate mechanically to ensure that the trees receive even sunlight. Access to the store is through full-height, glazed pivoting doors on both levels, directly from the Dubai Mall. On the lower level, a specially designed area for accessories display, The Avenue, sits in the midst of a grove of trees, which creates a calm environment for customers to explore the store. Full thanks and acknowledgement are given to Foster + Partners for the information given to write this article. • Each of the 18 wings is 11m tall, 3m wide and weighs just 1 ton. • Each wing consists of 340 carbon-fibre rods, whose geometry was designed so that none of them intersect. • The wings are thicker towards the middle to resist wind loads, and together with the terrace overhang improve interior thermal comfort. • Being motorised, the wings take one minute to open or close. Caption Main Image: At night, the solar wings open to reveal a breath-taking view of the waterside promenade and fountains.